Planning a surf trip to Brazil can be a little tricky, most people don’t realize how big the country is and might plan to visit north and south regions by car in two weeks. Sorry to tell you, but you would spend most of your time inside your car and not surfing—not a good idea. First of all, decide how many days you have, and start from there. If you have 2 weeks or less, it’s best to choose one region and explore a smaller region—I assure you will have plenty to see and surf. Here is a surfers guide to Garopaba, Santa Catarina – Brazil. Before you buy your ticket, don’t be a kook and check our updated Airline Surfboard Boardbag Fee Guide for Surfers. From April to September, the weather is mild or even cold (south Brazil) and southern region catches east to south swells. From November to March, is meltingly hot summer, during this time northern Brazil catches northern swells. Nevertheless always bring your full 3/2 wetsuit when you visit the south of Brazil. In this post we will talk about Garopaba, a small coastal region in southern Brazil located on the state of Santa Catarina, known as the surfers state—you will understand why once you get to the end of this article. 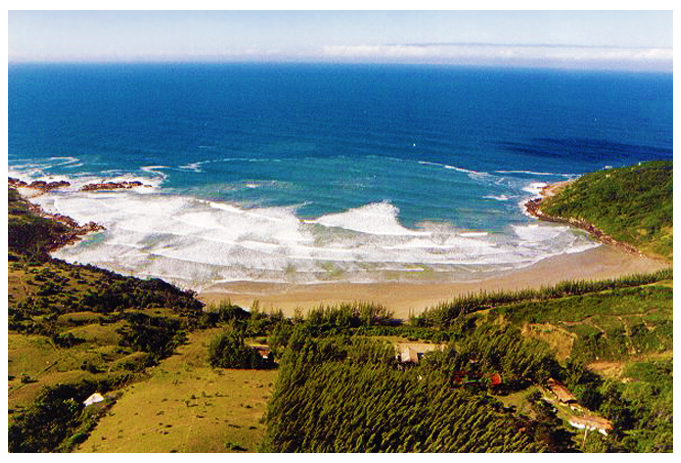 Garopaba is located 55 miles south from Florianopolis (Santa Catarina’s capital) and has a population of 20K people. The region comprises of Garopaba Town and a few other small beach villages—you can surf in all of them! The economy depends mainly on fishing and tourism. Which means: surf and beers everyday, helping the local economy. The main breaks are: Rosa Norte, Silveira, Vermelha e Ferrugem, all of them are driving distance to each other. Just another summer day in Garopaba starts with a good surf session, while the wind is still calm. Then, go home, have breakfast, get some rest and prepare your stuff to go back to the beach and spend the rest of your day. Chairs, sombrero, sarongs, water, sunscreen, camera, surfboards, etc. Arriving at the beach, settle down and go to the local bar/shack, order some fried shrimp and a cold Original Beer (local beer). Sit, relax and enjoy the view of beautiful people, white sand, blue ocean and the rain forest right behind you. Surfing and napping is also mandatory along the day. At the end of the day, you will leave the beach starving, go to an “all you can eat” restaurant and be happy, or go home and make an awesome barbecue with your friends and more Original. Tomorrow starts all over again. Sound good? Arriving in Florianopolis Airport, you will need to rent a car. You can use the Airport Website to compare fares from different car rental companies and book prior your trip. Remember to ask for surf racks or bring your own Wave Tribe hemp travel racks and straps. Price average for a SUV is U$50/day. Leaving the Airport you will take the freeway BR-101 direction south. After 50 miles, you will see a sign for Garopaba and turn left. You will enter a municipal road SC-434 that will take you to all the beach villages and the beautiful beach town of Garopaba. There are many different options to stay, from luxury holiday rentals, B&B’s to simple fisherman’s shacks. The best option is to stay in a “Pousada”, they are kind of a B&B, but without the breakfast and most of them are safe (they have gates and night security). Usually a pousada offers a self-contained apartment, simple furnished, full kitchen and a barbecue (very important!). It will cost you around U$15-20/night per person. The main grocery shop is in Garopaba is Silveira Supermarket, but you will also find some mini-markets around. If you are feeling cheap, you can rent a simple fisherman shack for as low as U$8/night per person. There are 2 problems with this option: first they don’t have websites, so you might have to drive around and ask. Second, they are not very safe, doors are too easy to break into. Unfortunately there are bad people always looking for an opportunity to steal from tourists. Great view: This house is something. Ok, now you have a car and a place to sleep. Let’s check the surf! The main breaks are Silveira, Ferrugem, Vermelha and Rosa Norte. To get to Silveira you need to take a dirt road from the main SC-434, close to Mormaii surf shop. The waves break on the south side of the beach, a nice right starts from behind the rocks and enter the beach. The beach is not developed, there are no bars around, so bring your all your stuff if you plan to stay there for the day. Praia da Silveira beach in Garopaba, Santa Catarina, Brazil. It’s just 4 miles from Garopaba, follow the signs and you will be fine. It’s also a sand bottom and works lefts and rights. In contrast with Silveira, Ferrugem is very developed with many bars, lots of beautiful people and a good atmosphere—it’s a great place to spend the day. Watch this video, this is just another summer day at Praia da Ferrugem. You can only get there walking on a trail from Rosa Norte, 20-30 minutes. The beach has no development at all, you will want to bring some water. The bottom is sand with some rocks. Even if there is no surf, the trail is worth it for such amazing view! Praia Vermelha, Garopaba, Santa Catarina, Brazil. Praia do Rosa has two breaks, Norte and Sul, or north and south. Rosa Norte is more consistent, the rocks on the coast protect the break from the north wind and you can easily paddle out thru a channel right close to the rocks. To get there you can park your car at Rosa Sul and walk along the beach, or park at the parking lot up the hill on Rosa Norte, then walk the trail down to the beach. Rosa Norte, Garopaba, Santa Catarina, Brazil. If you are travelling with your other half and want to take her/him for a special romantic date, Tigre Asiático located at Praia do Rosa is a great option. Asian food, candle lights, you know the rest. Inside Tigre Asiatico Restaurant in Praia do Rosa, Santa Catarina, Brazil. There are some “all you can eat” types where you pay $10, get to choose one type of protein (fish, chicken or steak) and it usually comes with: spaghetti, salad, beans, rice, french fries, fried eggs. You can always ask for more if it’s not enough. There is a really good one on the main road in Praia do Rosa, just opposite side of the road to Ouvidor. Wooden deck, easy to find. There are a few small surf shops in Garopaba Town, Ferrugem and Praia do Rosa that would cover your needs, but if you are in town there is a bigger and more complete shop called Mormaii located in downtown Garopaba, they also have a nice café in the shop. Cafe inside Mormaii Surf Shop in Garopaba Town. The night life takes place mostly during summer time, Praia da Ferrugem is the busiest place, it’s really a party town with many bars next to each other on the main road. A good option if you want to hang for a few beers and music is Beleza Pura, a bar in Praia do Rosa main road and is open year around with live music on the weekends—beautiful people and flirting atmosphere, if you are single, that’s the place to be. Met someone at Beleza Pura, fell in love with the place and want to live there forever. Ok, that happens a lot. This is a magical spot in the world. Here are a few real states if you are planning to buy or rent a house. Remember to invite me for a visit! Almost forgot, how’s the crowd? In the winter the crowd is ok during week but is busy on the weekends. In contrast, the summer crowd is insane. Be nice to the locals, have fun and invite them to share some beers and you’ll get more waves. Praia do Rosa Facebook Page here , you will find information about lodging, events, surf, restaurants, etc. Praia da Ferrugem on Trip Advisor.